David Fretwell from West Farm has installed a sediment trap which not only reduces pollution entering the river but benefits his crops. 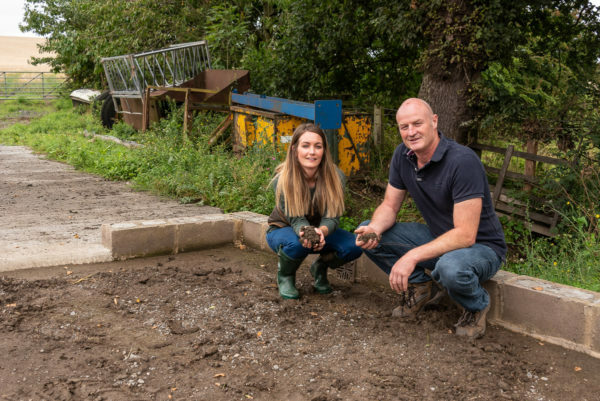 The work is part of a project by Tyne Rivers Trust to work with farmers to reduce the amount of diffuse pollution entering the river system around the Ouseburn. The sediment trap which catches waste that would have run into the river is just one of the measures to improve water quality in the Ouseburn which is classified as a failing water body. The project came about following a study by Tyne Rivers Trust, which focused on the role that farms around the Ouseburn can play in reducing pollution that enters the river and therefore improving water quality. The Trust set up a partnership with the Environment Agency, Northumbrian Water, Newcastle City Council, Groundwork NE & Cumbria and Natural England to help farmers take practical steps to do this. David Fretwell from West Farm is one of the first farmers to complete work on his cattle and arable farm. The sediment trap which catches waste that would have run into the river is just one of the measures to prevent waste flowing into the water. He has also concreted his yard to make it easier to separate dirty water and prevent it from running into the river. Danielle Anderson-Walker, Farms Liaison Officer at Tyne Rivers Trust says: “This work is just one of many practical measures that we have helped to put in place to tackle the high levels of pollution in the Ouseburn.